This film, the festival’s centerpiece, marks the midway point of the festival, and it seemed to be a good turn out for it. I wandered back into the Liberty Theater last night, and quickly settled into a seat I’m quickly beginning to see as mine – A8 (that’s odd… I just realized my seat on my flight over was 8A… ooohhh!). 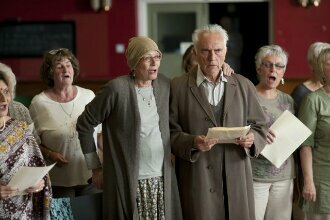 This crowd pleasing film features standout performances from Terence Stamp, Vanessa Redgrave, the always lovely Gemma Arterton, and Christopher Eccelston. 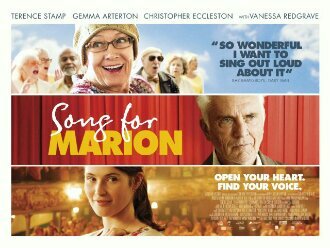 Marion (Redgrave) is battling cancer, is in love with her cantankerous and closed off husband, Arthur (Stamp), and finds joy in singing in a choir with fellow singers, conducted by Elizabeth (Aterton). Arthur on the other hand, dismisses the choir, and could never connect with his son, James (Eccleston). He loves Marion completely, and wants nothing but to look after and care for her. Consequently, he seems to be missing all the moments they could be sharing together. When the cancer comes back in a big way everyone is left stunned and trying to figure out how to live their lives now. We have here a film that is warm-hearted, bittersweet, and if you allow yourself to fall under its spell, completely able to sweep you up in its narrative. Stamp plays Arthur so well, encapsulating the cranky old man who is set adrift by loss, and finds a way to celebrate life and family again. Aterton is always a delight, and the friendship Elizabeth fosters with Arthur is wonderful to watch unfold, as she helps him break through the shell he has been in for so very long. There’s a heart-touching scene where James and his young daughter are in the kitchen laughing and chatting, and we see Arthur standing in the hall outside, tempted to join them, you can see it on his face, and then he pushes it back down, and returns to his room, sitting at the end of the bed. That one moment portrays everything about Arthur perfectly, he’s worked so hard and so long to keep everything at a distance, that he can no longer knock down the walls alone, but he can’t ask for help. Happily Elizabeth starts to do it anyway, slowly getting him to open up, and finally sing. He then goes on to start making amends with family, friends and the choir. The singing is great, and the songs chosen for the choir to perform aren’t the ones you’d expect, which brings all manner of smiles to the viewer. This one is a wonderful dramedy, and highly enjoyable. This one delighted the BIFF crowd and the audience was filled with laughter and I’m sure I heard a sniffle or two. Apparently Entertainment One has the distribution rights for this one, and I may have to start pestering them for a copy when I get home. As the dreary weather seems intent on holding for another day I get ready for a double feature tonight at the Liberty. I’ve now seen more films there now, than I ever did when I was here. Wow.